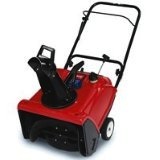 Due to it’s size, the Toro Power Clear 210 Snow Blower is very well liked. It’s not as small as some of Toro’s other models like the Toro 1800 Power Curve Snow Blower or the Toro Power Clear 180 Snowblower but it’s also not as big as other models like the Toro Power Clear 221 snowblower. It’s kind of like Goldilock’s and the 3 Bears. It’s in the middle and it’s just right! The Toro 210 is powered by a robust R*Tek, 2 stroke engine that was manufactured in house by the team at Toro. It’s 0.14 liters in size. The engine takes gasoline that needs to be premixed with oil. This strong engine allows the Toro Power Clear 210 snowblower to attack a width of snow up to 0.53 m (21 inches) wide and throw it up to 9.14 m (30 feet) from where it’s standing. This is usually an adequate distance on most driveways so that you don’t have to ‘re-throw’ snow, thus saving time. The Toro 210 Power Clear is started either by a pull string or by an 120 volt AC electric starting system for the electric model. Most people prefer the electric starting system as using a recoil starting system is not desirable when it’s freezing cold outside. The Toro Power Clear 210 snowblower uses a Toro Snow Curve rubber rotor for it’s auger. Using rubber for the auger may sound cheap and weak, but it is actually high strength rubber that won’t fail when you need it most so don’t let it put you off. The Toro 210 snow thrower has 2 different weights depending on whether you buy the electric model or the 210 with the R*Tek engine. The electric model weighs slightly less at 33 kg (72 lbs) while the gasoline powered model weighs in at 34 kg (74 lbs). The machine is self propelled and has a 1 liter fuel capacity. It uses a plastic deflector chute that rotates easily through up to 180 degrees. Click Here To Buy The Toro Power Clear 210 Snowblower.